This book explores how power is negotiated in women’s prisons. Drawing on fieldwork conducted in three penal establishments in England, it analyses how women manage the restrictions of imprisonment and the manner in which they attempt to resist institutional control. It is proposed that power is negotiated on a private, individual level, as women often resist the institution simply by trying to maintain an image of control over their own lives. However, their image of themselves as active, reasoning agents is undermined by institutional regimes which encourage traditional, passive, feminine behaviour at the same time as they deny the women their identities and responsibilities as mothers, wives, girlfriends and sisters. Femininity is, therefore, both the form and the goal of women’s imprisonment. Yet paradoxically, femininity also offers the possibility of resistance, because women manage to rebel by appropriating and changing aspects of it. 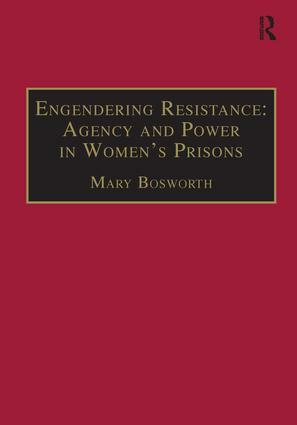 Contents: Introduction; Agency and power in women’s prisons: an overview; Reading the prison: a review of the literature; Re-evaluating difference: the gender of justice, care and power; Towards legitimate research methods, or working by, on, for and with women; Gender, identity and the prison: punishing their bodies, punishing their selves; Voices of agency, voices of resistance: negotiating power relations in prison; Conclusion: women’s imprisonment: conclusions and new directions; Appendix; References; Index.